The University of Plymouth has a fleet of vessels ranging from a large Aluminium Survey vessel to smaller work boats. 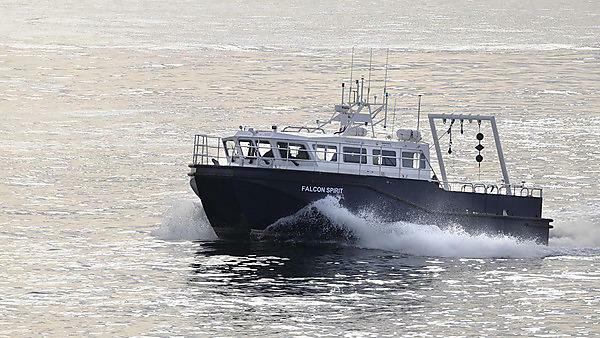 RV Falcon Spirit is a 14 metre aluminium catamaran configured as a flexible platform for teaching and research. It is used extensively for oceanographic and biological sampling as well as hydrographic survey. To support this, it has lifting capability via a stern H-frame, a variety of mounting points for survey equipment and both dry and wet laboratory spaces. Coded to sail 60 nautical miles from a safe haven, she's equipped with a galley, teaching area, six berths, all modern navigational aids and a heater! Weekend sailing with appropriately qualified students is a great way to build experience and confidence. Two of our vessels regularly undertake the role of dive support vessel as well as other support roles for teaching and research. We have three types of small powerboats, namely Polar Cirkel workboats, an Orkney Day-Angler, and an Arancia inflatable which many will recognise from its usual role of lifeguards surf-rescue boat. These are used in a variety of dive support, student and research project sampling and coastal survey roles. They can accommodate three to eight persons and are either coded by the Maritime Coastguard Agency or licensed by Plymouth City Council.